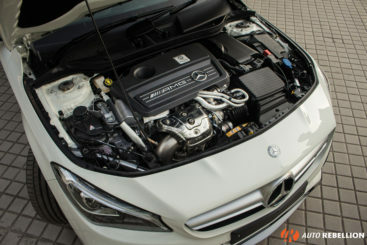 AMG tuned Mercs has always been known to be a growling beefy masculine supercharged or turbocharged monsters of the road. They are very well known to build higher displacement tuned engines with huge wheels, blacked out badges, and ofcourse the aggressive AMG style bodykit aero package. The German power house has now got it hands on the baby CLS. Mercedes calls it the CLA 45 AMG. The CLA 45 AMG’s takes its looks from the bigger CLS. With its curvy front and rear end you either love the design or hate it. However don’t be fooled when we call it a ‘baby’ because this car is an absolute pocket rocket. With the ever changing restrictions on emissions and how petrol cars contributing to the green house gases, its no longer a game of higher displacement and all muscle. The industry is now playing around with smaller engines that can punch out like the bigger boys. The CLA 45 AMG is no exception, since it’s a stunning example of how a 2.0ltr 4 cylinder engine can produce 475Nm of torque at 1500 rpm and 375bhp all way to 6000rpm. Thanks to AMG the 45 AMG has upgraded multi-link suspension, upgraded braking with drilled AMG rotors, a new exhaust system and a seven speed dual clutch transmission putting down all that power. 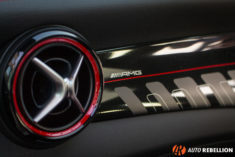 Every AMG is handcrafted and hand built with one specific craftsman for every car. 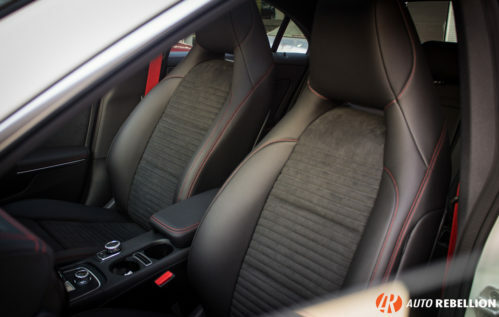 From the engine to every upholstery is all done and put together with minimal machine inputs. 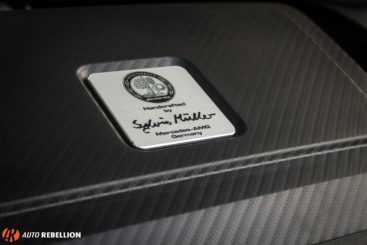 The maker of every AMG has his signature in a metal badge on the engine bay and our CLA 45 AMG was built by someone named Sylvio Muller. 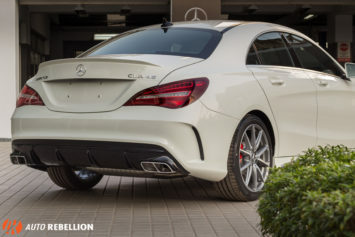 The CLA 45AMG is very much the A45 AMG under its sedan skin, with slight differences in suspension components. 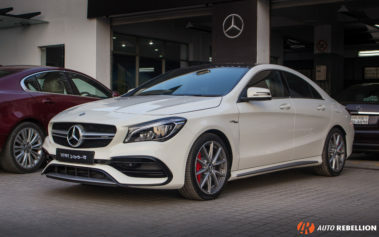 With the aggressive body kit and 18inch AMG alloys, AMG brake calipers, rear aero diffusers, this CLA definitely has a bolder introduction on the road. It also sits much lower than the regular CLA series. The car has another trick up its sleeve that makes it even more capable around corners. Normally AMGs are known to be coming in RWD churning out rubber , drifting about in the corners but this time , Mercedes AMG has decided this baby rocket to go with AWD that uses a special rear clutch to transfer 50% of power to the rear whenever requires. All these magic is controlled by the same computer that Mercedes put in the SLS AMG. The exhaust system of this car is exactly what you’d expect on an AMG model and not to be fooled by its smaller displacement of 2.0ltrs but this baby would give you the pops and bangs lifting of the throttle. 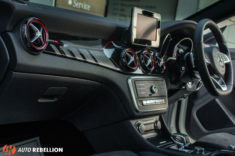 The CLA 45 AMG is amazingly quick with a time of around 4.6 seconds to 100km/h. The turbo does a very good job in boosting up those powers and its very much lag free. It’s all about the perfect refined German engineering in this one. The engine is built upon forged crankshafts and pistons and a special coating on the walls for reducing fictional losses. 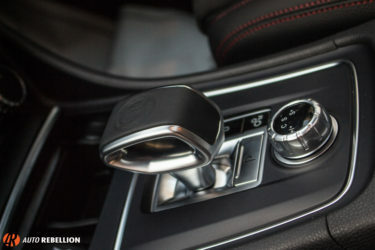 It has all the technical tid bits of a classy Mercedes, paddle shifters, drive modes from Race to comfort where a valve changes the exhaust note of the engine , a beautiful panoramic roof, Harman Kardon entertainment system with 12 speakers and AMG sports seats. Rancon Motors Mercedes Benz has imported this car and there may very well another one on its way. 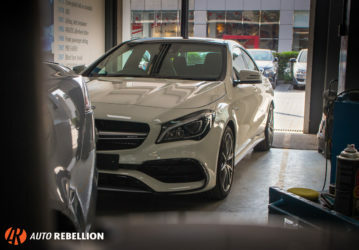 The reason we love the CLA 45 AMG is because it’s a result of how the world is going towards smaller displacements but producing more torque and horsepower all within the sensibility, refinement of luxury and superior build quality. And this trend coming from the Germans who were known to be building expensive and monstrous V8s and V12s back in the days, it is indeed a new beginning in the car industry and we hope other manufacturers adapt this technicality and prove that displacement isn’t everything.